The last couple of weeks have been very eventful in the cricketing circles. The news of BCCI terminating the contract of IPL franchisee Kochi Tuskers Kerala (KTK) made the fans of T20 jump with joy a la Principal Weatherbee from Archie comics when Archie fails to turn up at the Riverdale High. Like Principal Weatherbee, the T20 fans celebrated, also by doing a cartwheel. The reason was that the fans would have a Jadu-free IPL, season 5. (Ravinder Jadeja is called "Jadu" in Jamnagar,the place he hails from) . Unlike how Sehwag used to be called "Najafgarh ka Tendulkar" , no one calls Ravinder Jadeja, "Jadu from Jamnagar" even in Jamnagar!! But so what? we'll call him that! Before the fans could complete the celebrations and land on their feet after the cartwheel, the BCCI dropped a bomb that all the players of KTK would be rehabilitated, which meant the ghost of Jadu would still haunt us!! Ask any member of the team what is more painful? Watching Chanderpaul bat for hours or Ravinder Jadeja's presence,and ten out of eleven players would say it was Jadeja's presence and the only player who would differ would be Jadu himself! Jadeja has made more comebacks to the Indian team than Mohinder Amarnath and Ajit Agarkar put together. The speciality of Jadu contributing to his team's defeat is unparalleled and one which could be seen in 2010 T20 world cup where his bowling cost us the cup. In fact, when Jadeja comes in to bowl the lives of the spectators at the stadia are in grave danger with ball travelling in the stands as frequently as Madhuri travels from US to India !! 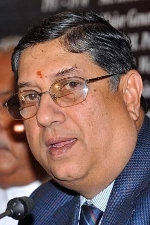 When the new BCCI chief N. Sreenivasan said that all KTK players would be rehabilitated, he had a glint of mischief in his eyes and a smile which he was trying to conceal between his third and the fourth chin ( his double chin has a double chin you see)!! Sreenivasan was trying to control his laughter at the prospect of making Jadu play in any other team except his CSK which meant Dhoni, Raina, & co. could have some batting practice in the matches itself which would free them from net practie time and spend the valuable time endorsing various products. Other teams may avoid Jadu, but there is a team, Jadu would not like to be a part of and that is Pune Warriors. Our mole in the team informs us that whatever reasons Jadu may cite but he doesn't like the Pune team as their cheergirls wear the indian attire and Jadu prefers the phirang babes and the western outfits. There is a conspiracy brewing amongst the teams and the teams are undivided in opinion over keeping our Jadu out. But knowing Jadu, he has already set his 'nazar' on the remaining teams and going by the previous experience of making comebacks into the Indian team again and again, we are sure Jadu, is going to return with a vengeance. For Jadu to qualify in the RCB team he is supposed to beat Chris Gayle at Arm wrestling which would be as uncommon as Kangana Ranaut receiving a national award for acting. With kings XI punjab, Jadu will be given an ardeous task of running 100 meters before hugging Preity zinta. With the experienced Piyush Chawla around you think anyone stands a chance to hug Preity? This is all Piyush has been doing in IPL, isn't it? Close sources inform us that Jadu stands a little or no chance of making it into the Delhi Daredevils (DD)team. It so happened that, in the last season of IPL, a scribe asked Sehwag whether he was in the race for an Orange cap (For the uninitiated, orange cap is awarded to the batsman who scores the highest runs in the IPL tournament); to which Sehwag replied "Orange cap? What's the big deal? All players from KTK wear an orange cap, including idiots like Jadeja". Jadu who had come near the DD "dug out" to have a closer look at the DD cheergirls heard what Sehwag said. Later, Sreesanth translated it for him and Jadu was so furious that he vowed never to play for DD even if he was bought by them at the auction or play under the captaincy of Sehwag. Now there is a public demand to make Sehwag the team India captain so that the people will be ensured of Jadeja free Team India! The other teams are coming up with novel ways to keep Jadu away from entering their teams. Kolkatta Knight Riders (KKR) are having a 3 question entrance test for Jadu. Question no. 1: Name the passenger liner which rammed into an iceberg on its maiden voyage?. If Jadu answers it correctly as "Titanic" then comes the 2nd question: How many people were on board the Titanic?. If Jadu gets even this right and says 2223 then comes the 3rd question: Name all 2223 people on board the Titanic. This is cruel on your part Shahrukh!! Even RA-one would not be able to answer that but we are not complaining!! The other teams are brainstorming on how to keep Jadu out and the moment we get to know their plans we will publish it here! Watch this space! !